In the twenty-four years that characterize the last six Italian Legislatures (1994-2018), in Italy there were: seven political elections and fifteen Governments; three constitutional referenda; four electoral laws for the political elections as well as two rulings of the Constitutional Court which, breaking an ancient tradition of self-restraint, expressed themselves for the first time on the electoral law for the general elections. The essay analyzes the lines of persistence and change occurred in these years, trying to capture the dynamics of a democracy still struggling between a consensual or a competitive model. This essay intends to pr opose some historical-juridical considerations on the age-old story of electoral reforms in Italy, with particular attention to their consequences on the evolution of the form of government. Thirty years ago the transition from proportional to the majority system was seen as the only picklock able to undermine a political system in crisis and create the legal conditions to build another. Today, after the constitutional referendum and the judgement of the Constitutional Court on “Italicum”, the discussion on electoral laws has definitively lost the reformist impulse possessed in the past. 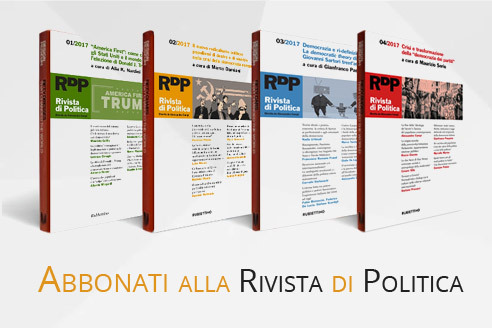 The article analyzes its reasons by retracing the most significant stages of the parable that starts from the electoral referendum of the early nineties and reaches the new electoral law applied for the first time on March 4, 2018, trying to understand the reasons for the historical failure of a perspective which appeared very promising. The history of what is called the Italian second republic is, in many ways, a history of missed opportunities The article develops in three paragraphs. In the first place, a brief re-enactment of the context in which the collapse of the first republic took place, with an analysis of the factors that were an obstacle to a functional reorganization of the political system. Secondly, a review of the general attitude of the main political forces. Finally, a re-enactment, even if not exhaustive, of missed opportunities from the center right, from the center left, as well as those related to institutional reforms. Eugenio Capozzi, The “majority system decade” in Italy (1994-2005). An appraisal in terms of political history. In the 11 years phase in which a 75 per cent first-past-the-post election law has been in force in Italy (1994-2005) the Italian political system didn’t come any closer to “Wensminster”, two-parties model than it had done in previous history. Rather, the most part of Italian civil society appreciated that law mainly as a means to “punish” and defenestrate the political élites which had been in charge since the return to democracy after the fall of the Fascist regime. Not suprisingly, then, after 2005 the mixed plurality/proportional “Mattarellum” was cancelled, in favour of new laws which mostly emphasized the role played by personal political leadership. This work aims to explain why, in all Western democracies, the number of proposals of electoral reform has been growing in the last two decades, and why it is likely to grow even more in the next future. The reasons are not strictly political. The main variables to explain this shift, from stable to weak and vulnerable electoral system are sociological, cultural and psychological. The transition from Modernism to Postmodernism and the role played by mass media and ICT on our thoughts and behaviors are the most important keys to understand why even electoral laws and systems are now perceived and considered as a consumeristic object. Published in July 1930 as the trial issue of a magazine to come, Il Rosai is a higly relevant document of what we call «fascismo-movimento». Collaborate on Il Rosai Berto Ricci, “superfascist” and «mystic» of the «national revolution»; Dino Garrone, even “superfascist”, writer and journalist, close to D’Annunzio and Malaparte; Gioacchino Contri, editor in chief of the florentine fascist magazine Il Bargello; and Edoardo Persico, catholic and anti-fascist, grown-up with Piero Gobetti between Neaples and Turin. They were gathered by the admiration for Ottone Rosai (1895-1957), the Florentine painter that gives the pamphlet its name, First World War ardito, patriot and fascist. Il Rosai is a sort of incunabulum of juvenile cultural dissent against Mussolini’s regime: as such, it anticipates future anxieties and explores topics we find again associated with artistic or cultural moviments of the late Thirties|early Fourties, as Corrente di vita giovanile, if not later (as for example Arte povera). Ideologically distant as they are, Ricci and Garrone, Persico and Contri ask for a major public role of the artist, whose duty is to be a sort of political «saint» or|and a social hero, brave, selfless, sincere. Pushed pretty beyond its aesthetical limits in a way we can legitimately beware, art presents itself in Il Rosai as the most effective surrogate of politics. 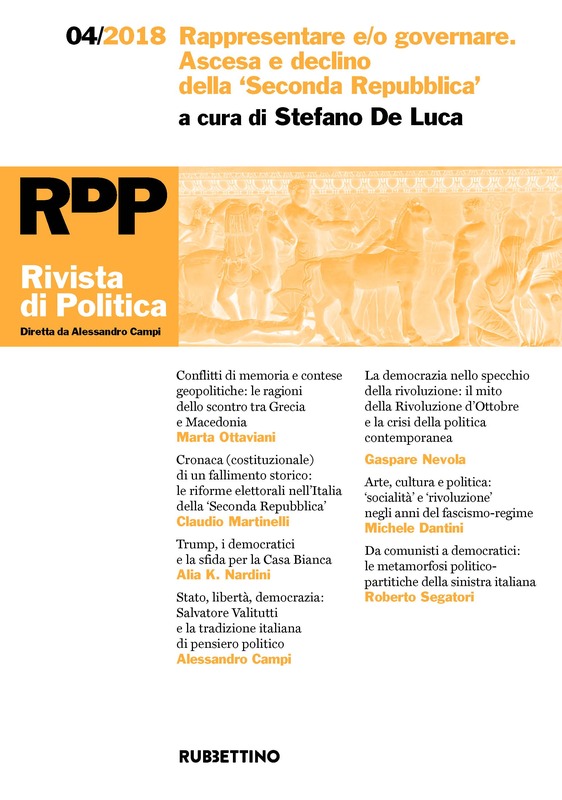 The lack in Italy of a solid ideological-political tradition inspired by the values ​​of liberalism is a recurrent judgment in national historiography, on which many scholars converge (in some cases polemically). A gap that naturally admits many significant exceptions, such as the figure of Salvatore Valitutti: politician and pedagogist, but also a scholar of politics. The essay descrive his journey from the fascism to a liberalism always very attentive to the political-state dimension. But the article also recalls the role played by Valitutti within the Faculty ‘fascist’ of Political Sciences of Perugia and, in general, in Umbria during the years of the Mussolini regime. As all organizations, political parties go through life cycles: birth, growth, maturity and decline. The parabolic trend can be reversed by the action of leaders with strategic vision. In the case of the largest party of the Italian left (in the time Pci-Pds-Ds-Pd) four national secretaries (Berlinguer, Occhetto, Veltroni and Renzi) tried to reverse the critical route. Two of them (Berlinguer and Renzi) had an initial electoral success, but in the end even they were unable to prevent the party’s decline. In the meantime they have changed the people represented (from industrial workers to middle classes, public employees and pensioners), the vision and the value of the internal loyalty. The rebirth of the Democratic Party can only take place if there is a limit to the opposing internal visions, which “intoxicates” the body of the party, and if the current antagonists (the League and the 5 Star Movement) will be unable to realize their extraordinary electoral promises. This essay deals with the relationship between October Revolution and democratic disenchantment. The essay proposes the idea that the bond between democracy and socialismi a still an open question for public and academic debate. Contemporary Western societies aren’t today in good health: they seem losing harmony with their political and cultural principles and institutions, with their liberal-democratic governments. A democratic malaise is weakining their moral and value texture, and triggering a remaking of politics whose lines are hard to decode. The main political-ideological cleavage inherited from the XIXth and XXth centuries, right/left, is losing its ability in structuring the divisions of contemporary political pluralism. A new “old” cleavage is gaining political space: pro-system vs. anti-system politics. The malaise is (still) democratic. But it lacks of a recognizable “normative orientation”: we are living in and with tired democracies, without shared values and ideal horizon. Here we present two thesis: 1) the neoliberal pensée unique permeates the democratic dissatisfaction, and this fact has become a really trap for the quality of liberal mass democracy; 2) this situation has a historical relationship with the “sunset of socialism”, with the breakdown of sovietic world and the “removal” of October Revolution. The effect has been the development of democratic regimes that would look at a quiet and pragmatic collective living. But the drying up of every utopian resource, as we can see newdays, has bad setbacks on democracy, and hides insidious implications for democratic institutions, values and political culture. In short, in this essay we discuss: why there is a bond between socialism and democracy? Which has been the historical and political meaning of Sovietic Revolution for Western democracy? Why democracy needs alternatives and challengers?